The last-ditch effort by Senate Republicans to repeal the Affordable Care Act was defeated in the early hours of Friday morning, dealing a “humiliating” blow to President Donald Trump and the GOP and sparking jubilant celebration among those who have marched, called their representatives, and risked arrest for months to ensure Trumpcare’s demise. In the end, Sens. Susan Collins (R-Maine), Lisa Murkowski (R-Alaska), and John McCain (R-Ariz.) defected from their party to vote down the so-called “skinny repeal” effort, which the Congressional Budget Office estimated would leave 16 million more Americans uninsured. As Senate Majority Leader Mitch McConnell (R-Ky.) delivered a dejected speech announcing the death of the repeal effort he spearheaded, demonstrators outside the Capitol building expressed excitement and relief that, at least for now, the GOP’s efforts to dismantle the Affordable Care Act, defund Planned Parenthood, and gut Medicaid have fallen short. “If millions of Americans had not raised their voices at town hall meetings, made phone calls to their senators, posted on social media, and resisted in other ways, this bill might already be law,” Anna Galland, executive director of MoveOn.org, said in a statement. But, Galland emphasized, the threat has not been entirely eliminated. This sentiment was echoed on social media and in speeches at the Capitol in response to Trumpcare’s defeat; many concluded that the struggle will continue until healthcare is guaranteed to all Americans as a right. 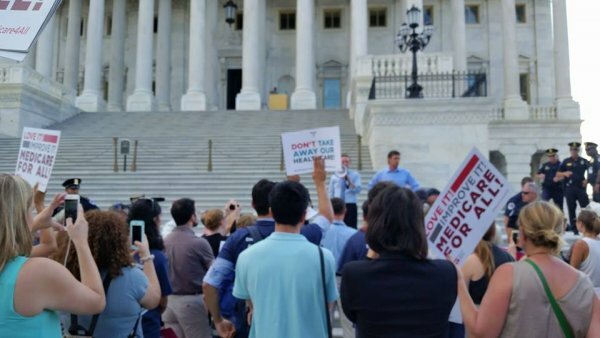 As Common Dreams has reported, grassroots support for federally funded universal healthcare has peaked during the Trumpcare fight, and organizations throughout the country are mobilizing to pressure lawmakers into siding with popular sentiment. Before this vote: fight for Medicare for all. During this vote: fight for Medicare for all. After this vote: fight for Medicare for all. Remember when they said it was either this bill or #MedicareForAll? Time to keep your promise to the voters.
? According To Astrology, August Will Finally Rejuvenate Our Inspiration And Bring Warmth & Relief Health Blogger Exposes The Reality Behind ‘Inspirational’ Instagram Pictures ?